Bushy semi-trailing growth habit and fine, narrow dark green leaves. Deep sky-blue flowers. Very aromatic. 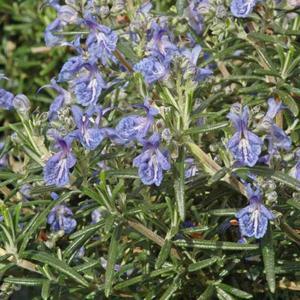 Thrives in very well drained, poor soils, preferably neutral to alkaline, in full sun. Drought tolerant, dislikes excessive winter wet. Needs a warm position, can be damaged by severe winters in cold areas. Best to cut back regularly to retain a bushy shape and prevent the plant becoming leggy.